Harvey has cerebral palsy and autism. He attends a school for children with special needs and, against the odds, appears to have a good understanding of others' feelings and is able to vocalise that. He is in a very supportive and loving family. He has been having Bowen for about 5 years and is a regular attender. Harvey is pictured here with his new autism sensory pack. Noah presented with global developmental delay and triplegic cerebral palsy with hypermobility. He has very few communication skills and this tends to make him frustrated. Noah is a delightful child and his parents naturally would like him to be able to express himself. To this end, TBLTF awarded Noah with an iPad with a Makaton signing app called ‘MyChoicePad’ through which Noah is now able to communicate. Against all expectations, Noah is now able to get around by himself - his mum reported this was the best Christmas present ever! Watch a short video of Noah (December 2017). This little boy has Pitt-Hopkins Syndrome which means he has developmental delays and is unable to walk independently or to talk. TBLTF bought Alfie a swing in a frame which has meant he is able to go outside to do something he really enjoys! The swing gives Alfie sensory input and is calming when he feels frustrated. Morgan has significant global development delay which means he is totally reliant on others for all his needs. TBLTF contributed towards the cost of a buggy which allows him to access and experience new locations that are not possible with a wheelchair. 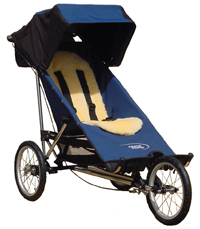 According to his physiotherapist the buggy allows Morgan to be involved in family pursuits and will have a positive effect on his physical and mental wellbeing. 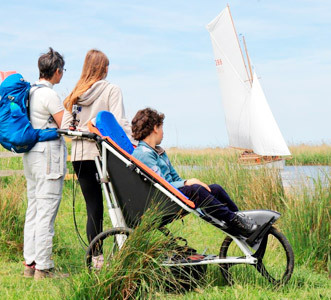 This all terrain buggy allowed a young boy with disabilities to go to the beach with his parents and new puppy, an outing they would never have been able to do without this equipment. As a family they are looking forward to the new experiences they can share together. TBLTF has made this possible. 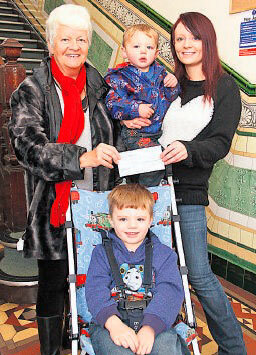 A little boy named Joshua Mathias was awarded £900 for an iPad and an iPad holder. This will be really helpful for Josh when he sits in his wheelchair. Joshua has Cerebral Palsy and epilepsy and needs 24 hour care 7 days a week. 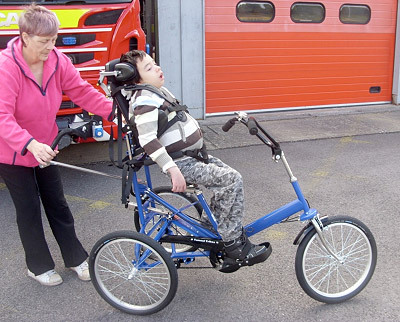 Josh has been receiving Bowen for just over a year from Jennifer Webster; he has grown rapidly and requires increasing amounts of sensory stimulation to calm him if distressed. 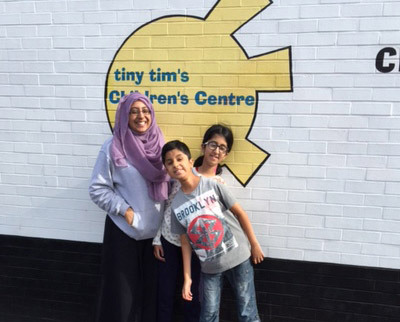 TBLTF UK made a substantial contribution to Hannah and Sufyaan Ali-Khan (pictured with their mother Naima) towards powered wheelchairs in May. Both Hannah and Sufyaan have muscular dystrophy (SEPN-1). Hannah is also a carrier for Duchenne MD. 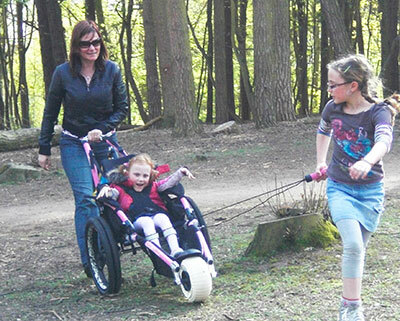 The need for powered wheelchairs to support their mobility is essential and with the help of sponsorship from various other charities as well as TBLTF UK this was made possible. Thank you to all of you who supported us at our stand at the Bowen Conference on 5-6 September, through the sale of our goody bags we raised £99.35. Thanks also to the organisers for donating money from the raffle to the fund in the sum of £200. One of the recipients of the awards in 2014 was a little boy called Jayden, who has Hypoxic Brain Injury through near drowning. Jayden now has no voluntary movement in his limbs, he can’t speak or reliably swallow and it is not known whether he can hear or see. 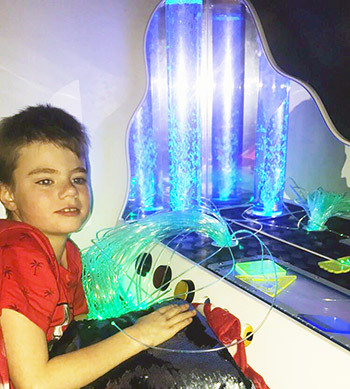 Jayden attends a school for children with profound learning difficulties where he appears to enjoy going and receives lots of stimulation (light, colour, sound). He also has regular Bowen treatments. Maximise his circulation and respiration. Lessen any stiffness in his joints and muscles – this is an ongoing daily struggle. Increase his mobility generally, especially in his spine, pelvis and knees. Rebecca’s paediatrician stated that she had no myelination happening in her brain (myelination being the process that causes maturation and allows ability to develop). Rebecca will need permenant and full-time care. 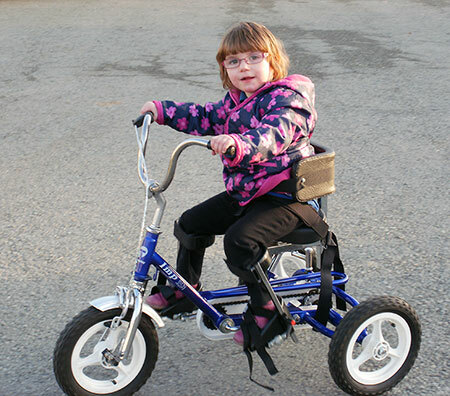 "The bike arrived last Monday, so Rebecca went on it when she got home from school. I struggled to get her on it as she was so excited she wasn't giving me time to tie the straps up. She started peddling straight away. Having the handle was a good idea as I am able to keep some control of her. Her ‘nain’ and ‘taid’ took her to Barmouth seaside to have a ride along the front and a good day was had. Both her grandparents were exhausted but Rebecca was ready for more." 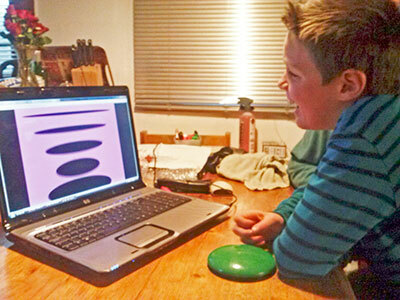 "Both his life and ours have already changed markedly as he can now take some control and just start playing on the computer, while his parents take ten minutes or so break! (Something previously missing from our lives). Angus, quite amazingly, picked up the correlation between pressing the switch and say, an aeroplane flying across the screen in what could only amount to ten minutes. His delight at being able to achieve this was remarkable." Celt who has been diagnosed with Cystic Fibrosis. With the help of the fund his parents were able to create a geulistrm free environment, which is essential for Celt’s wellbeing and also a trampoline for exercise. 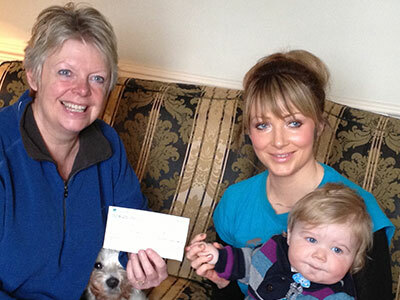 The picture shows Celt and his mother receiving the TBLTF UK cheque from their Bowen practitioner Carole Hough. 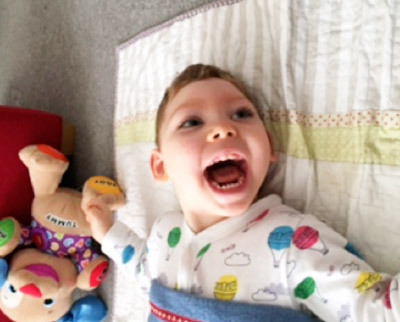 "Celt is an adorable, happy little boy who is full of smiles and laughter and shows no sign of discomfort or grumpiness as you would expect having to go through all this medication and intense, almost brutal, physiotherapy." 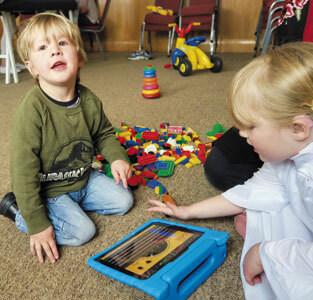 The picture below shows Harvey who has cerebral palsy. He was awarded a Britax traveller car seat. On the 12th August, Leicester Bowen Children’s Clinic (LBCC) was the venue for the presentation of a swing by the Tom Bowen Legacy Trust Fund. 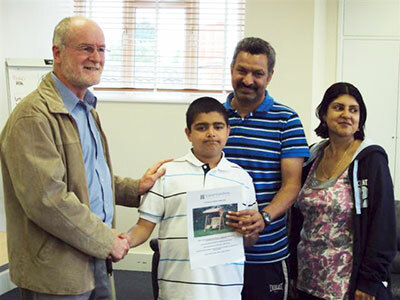 It was attended by David and Birgitte Howells who ran the fund in the UK, Ron Phelan from Australia, Rose Ward (and some of her team from the clinic) and Amer Singh, the young recipient, and his parents. This is the first item to be presented to a child in the UK that has been fully funded by money raised. Amer, has Autistic Spectrum Disorder and has made great improvements in the three years of regular visits to the childrens clinic. 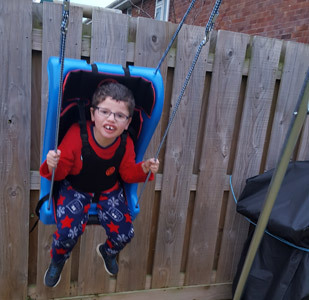 One of his ongoing issues has been that of co-ordination and balance and as part of his Occupational Therapy he has played on a specialist swing that gives important vestibular stimulation to encourage brain development. The presentation of this swing – a robust garden model – will enable him to have more of this stimulation through fun and play. Amer now attends a mainstream middle school full time with the help of a support worker. Teachers are pleased with his progress in language and social skills and he is presently showing interest in reading and how words are spelled. This presentation was made at the 2010 Bowen conference in Warwick where the UK branch of the fund was initially launched. The recipient of the fund was a little girl called Xena.